Pillory the Imperial Trump Style. 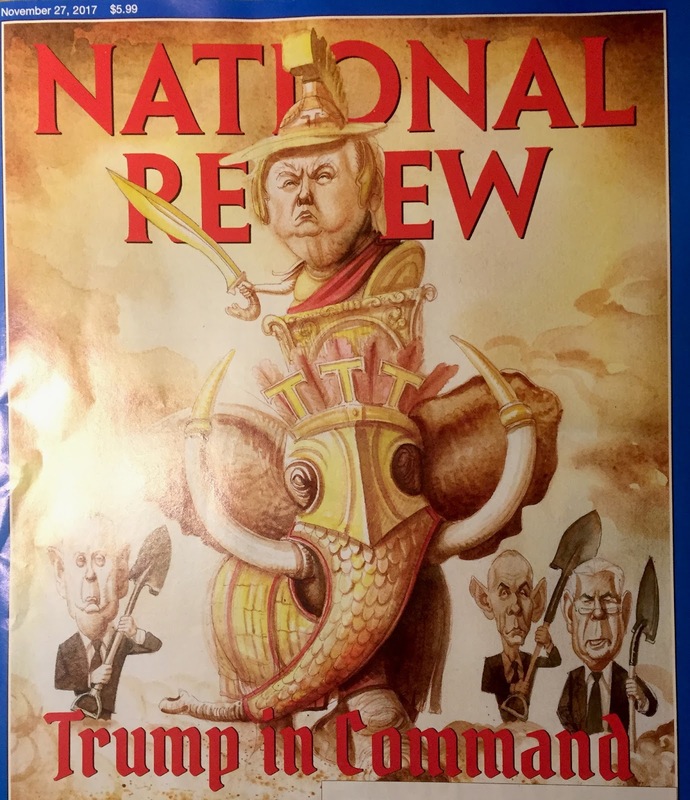 New York City, November 26, 2017 – The current National Review cover shows a regal Donald Trump-like figure sitting on a on gilded hathi howdah (हाथी हौदा) atop a gilt-armored elephant. 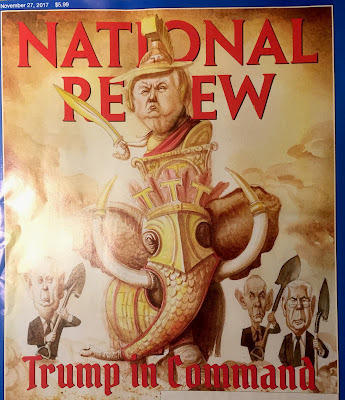 I should explain that I have been receiving the National Review for the last few years courtesy of a subscriber who gets an extra subscription every December to send to someone who could use it. Proud indeed I am to be her Designated Democrat. Back to the cover. Following behind the man on the golden hathi howdah are three men in black, carrying spades. Their faces bear the strong likenesses of three key non-family members of King Trump's inner circle. This put me in mind of re-posting something I originally posted on November 9, 2008, after the election of Barack Obama. Anyone reading this who is not a New Yorker or a circus follower should know that the elephants have reportedly made their last trip into New York City. November 9, 2008 – In spring, the Ringling Brothers and Barnum & Bailey circus comes to New York City. 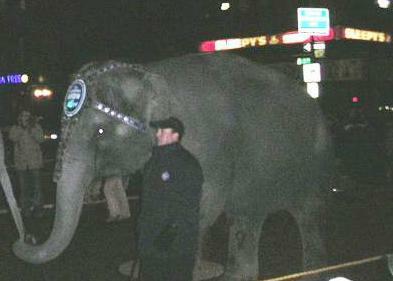 A dozen-and-a-half elephants march through the Queens Midtown Tunnel in the early a.m. to report for circus duty at Madison Square Garden. Following them warily is a cadre of sanitation workers with shovels, a truck and water to clean up the mess the elephants leave behind. by men with shovels, and a truck with a flushing system. - increased U.S. fiscal dependence on foreign debt buyers. - failed to regulate the shadow banking system. So it’s fair that the percentage-point drops in the Dow translate to drops in voter support for GOP candidates on November 4, 2008. No wonder John McCain has made a lunge for the middle-class vote with his out-of-character and poorly conceived American Homeownership Resurgence Plan. 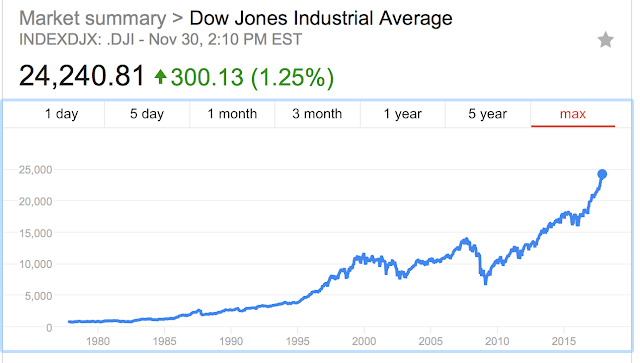 As an academic in the early 1980s, Mr. Bernanke pioneered the idea that the financial markets, rather than a neutral player in business cycles, could significantly amplify booms and busts. Widespread failures by banks could aggravate a downturn, as could a decline in creditworthiness by consumers or businesses, rendering them unable to borrow. Mr. Bernanke employed this “financial accelerator” theory to explain the extraordinary depth and duration of the Great Depression. Mr. Bernanke doesn’t say it, but the current crisis in the subprime mortgage market may be a perfect illustration of the financial accelerator at work today. Many subprime borrowers are facing bankruptcy because their net worth has collapsed and they can’t get new credit. Similarly, numerous subprime lenders have gone bankrupt because they could not get financing to continue operations from newly skeptical Wall Street lenders. The serious mistakes of modern day economic analysis are to ignore the huge trade imbalance created by the globalization process. The huge trade deficit of US must flow back to US market and be lent to someone. As we know, lending generates more lending and who knows how many trillions this US trade deficit have ballooned to every year. It is this huge liquidity glut that is supporting US Government’s debt spending, US consumers' borrow and spend frenzy, huge borrowings of private equity firms and other M&A activities, enormous borrowings of hedge funds and so on. It is no wonder that the prolonged Fed tightening has lost its punch and takes so long to affect the home mortgage market. CK - June 16, 2007.
unscathed. Photo by Alice Tepper Marlin. In 1989, New York City elected David Dinkins Mayor and Liz Holtzman Comptroller. It also approved a thoroughly revised New York City Charter, eliminating the historic Board of Estimate. The NYC Comptroller lost some powers but gained a new responsibility – it must report on the NYC economy every December and must submit to the NYC Council annually its independent tax-revenue estimate based on the Comptroller's economic outlook. To carry out this and other tasks, the Comptroller created the position of Chief Economist. It has been filled by five economists, all male. Over the 28 years of the title, three economists have held the job for four years. One has just started working in the title under Comptroller Stringer, one is Commissioner of Finance for Mayor de Blasio and the third became economic adviser to former Governor Pataki. The other two Chief Economists met recently. I was one, the second Chief Economist, having served for 13 years, under Comptrollers Holtzman, Alan Hevesi and Bill Thompson. Frank Braconi was the other, my successor, who served for ten years as Chief Economist, under Comptrollers Thompson, John Liu and Scott Stringer. You might say it was an informal meeting of FOCEA, the Former Office of the (New York City) Comptroller Employees Association. 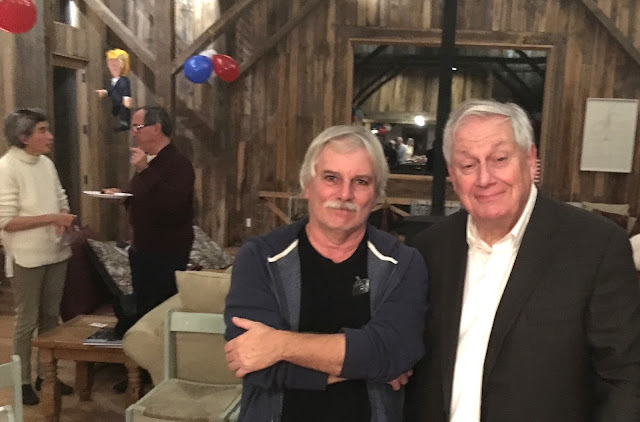 We met up yesterday evening at a post-election celebration hosted by a Suffolk County gadfly group (Resist & Replace) and the local Democratic party. We are united in getting behind a Democratic candidate in 2018 to defeat Lee Zeldin, a Tea Party incumbent Congressman from New York's District 1. An early order of business at the event was to tackle the Trump piñata, which may be seen to the upper left in the photo. Between us, my years and Frank Braconi's at the Comptroller's Office add up to a quarter century and take us through two attacks on the World Trade Center and four Mayors – Dinkins, Giuliani, Bloomberg and de Blasio. Postscript, January 28, 2018: Meanwhile, Eric Wollman visited Vero Beach, Florida, and we had our third annual Florida meeting of FOCEA. 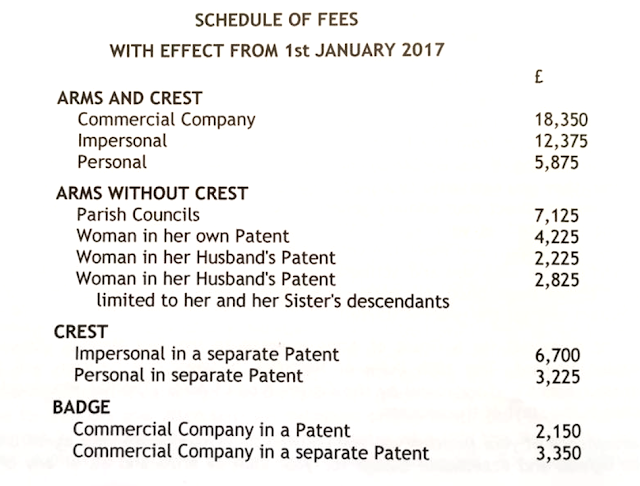 The 2017 College of Arms fee schedule for a coat of arms and crest is shown below. "Impersonal" arms would be for a city or town or church. The arms without crest would be the shield. The crest is above the shield and typically adorns a helmet. 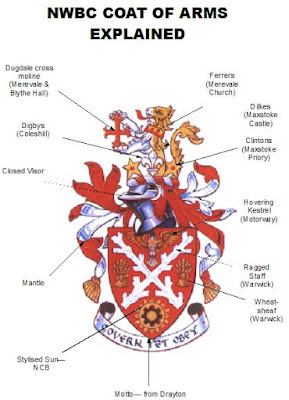 In the North Warwickshire Borough Council coat of arms the crest is a lion rampant holding a cross fleury. A "badge" is an armiger's equivalent to a logo. It could appear on clothing worn by staff, for example. The badge is priced only for commercial companies. 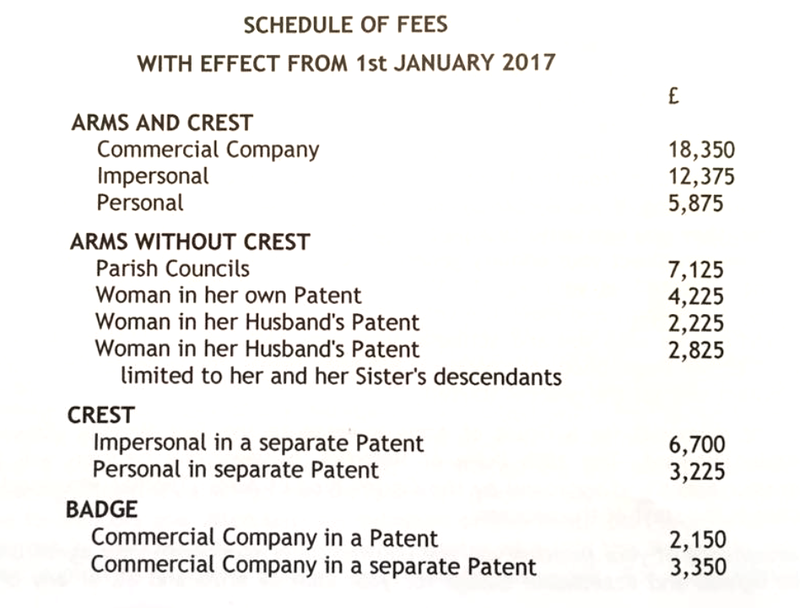 Any graduate of a good college with no identifiable character blemishes and a connection to England or Wales (as would be the case for a graduate of an English University) can petition to the Queen for a coat of arms. The largest U.S. array of new windmills in the ocean is being planned for the end of Long Island. 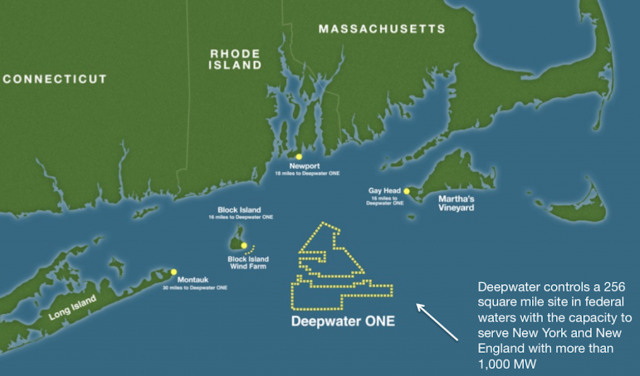 Called Deepwater One, the site is 30 miles from Montauk on the end of Long Island. It covers 256 square miles and can generate 1,000 Megawatts of electricity.